Interdisciplinary Studies is as unique as the students who seek us out! The structure we set out (below) is meant to enable a beautiful combination of academic rigor and flexibility. Since its founding in 1965, York University has established itself as “a leading interdisciplinary research and teaching university in Canada.” Initiated in 1972, the Master of Arts (MA) in Interdisciplinary Studies (IS) in the university’s Faculty of Graduate Studies (FGS) in many ways epitomizes this academic imperative. 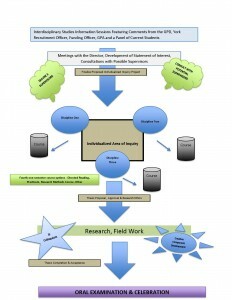 Conventional disciplinary approaches to graduate study and research at the tertiary level usually encourage students to consolidate and grow forms of knowledge and modes of analysis developed at the undergraduate level or gained through non-academic vocational and/or professional experience in a particular subject within a particular field of study. Some students, though, find such specialization too restrictive. IS offers such students an alternative, radically individualized model of graduate study and research. Not intended to compete with conventional MA programs, IS invites students to venture across traditional disciplinary boundaries and to bring into scholarly and/or creative conversation forms of knowledge and modes of analysis in ways not typically encouraged in other MA programs. Each IS student’s vision of an intellectual and/or creative project informs and structures an individualized program of study and research, not predetermined departmental or disciplinary expectations. Applicants may choose a 2-year program of study and research as a full-time student or a 3-year program of study and research as a part-time student. Both options provide students with an opportunity to pursue independent, innovative study and research that does not fit into traditional disciplinary categories. The primary objective of the Graduate Program in IS is to enable highly motivated students to pursue original research in ways that do not fit comfortably into methodological and theoretical categories represented by and propagated in conventional MA programs. Conventional approaches to graduate education suit most students perhaps, allowing them to consolidate forms of knowledge and to develop modes of analysis gained at the undergraduate level on a particular subject within a particular discipline or field of study. Some students, though, find such specialization too restrictive. Not intended to compete with conventional MA programs, IS invites such students to venture across traditional disciplinary boundaries and to bring into scholarly conversation fields of study and modes of analysis in ways not typically encouraged in other MA programs. IS seeks entering students, whether full-time or part-time, with the intellectual maturity and independent mindset normally associated with more advanced scholars, and then encourages them to further cultivate these qualities in the course of their studies at York. Though modest in size, IS enjoys a national and international reputation. It attracts applicants with a wide range of academic and professional backgrounds from across Canada, as well as from the United States and overseas. The career of every IS student culminates in the completion of an independently researched, academically innovative MA thesis. To achieve this end, every student works with a Supervisory Committee comprising three members of York University’s Faculty of Graduate Studies (FGS). Each supervisor represents one of three different disciplines pertinent to the student’s chosen topic of inquiry. Exposure to three different disciplines through contact with individual representative faculty members as well as through course work in all three disciplines, exposes students to similarities and differences of matter and method across disciplines and fields of study. Ideally, every student develops the intellectual capacity to achieve excellence in more than one discipline or field of study. At the same time, regular meetings with the Supervisory Committee as a whole ensure a developing process of combinative interdisciplinary thought and practice. Again, ideally, every student thus develops the ability to recognize, evaluate, interpret and integrate similarities and differences of matter and method, forms of knowledge and modes of analysis, across several disciplines and fields of study in effective and productive ways. Every IS student’s individual project must clearly demonstrate an integrated interdisciplinary engagement with three different fields of study and research. Students may elect any three recognized bona fides fields of scholarly and/or creative study and research, as long as each is taught and researched at York. First-year full-timers and first- and second-year part-timers take graduate courses in these three fields. At the same time, supported by program workshops, they actively participate in the design and execution of a series of linked interdisciplinary intellectual and/or creative undertakings, including development of awards and scholarships applications, a thesis proposal and a colloquium presentation of research in progress. Every IS student’s individualized program of study and research culminates in an independently researched, academically and/or creatively innovative thesis, which is subject to defence at oral examination. To achieve these goals, each IS student works with a committee of three full supervisors, each of whom must be qualified to teach and oversee research at the graduate level as members of FGS. Each supervisor ‘represents’ one of the three fields of study and research constituting a student’s interdisciplinary project. The supervisory committee assists the student in the creation of a coherent plan of study and provides opportunities for critical discussion of the student’s work throughout their time in the program. At any given time, one supervisor serves, primus inter pares, as coordinating chair of the supervisory committee. The current coordinating chair represents the full supervisory committee at the colloquium presentation of a student’s research in progress and on the committee examining the MA thesis at oral defence. Full-time funded students are also appointed as paid graduate assistants to their supervisors, to work within strictly mandated limits on projects that complement their own programs of study and research. IS students meet with supervisors individually and with the supervisory committee as a whole. Meeting with individual supervisors whose teaching and research interests vary widely exposes students to similarities and differences of matter and method across disciplines and fields of study. IS intends that every student develop the intellectual capacity to achieve excellence in more than one discipline or field of study. At the same time, regular meetings with the supervisory committee as a whole ensure an evolving process of combinative interdisciplinary thought and practice. Every student cultivates the ability to recognize, evaluate, interpret and integrate similarities and differences of matter and method, forms of knowledge and modes of analysis, across several disciplines and fields of study in effective and productive ways. Students are responsible for arranging these meetings, for providing agendas and for keeping accurate minutes of them. Once approved, the minutes of the full-committee meetings eventuate in interim and annual reports on the student’s progress through the program. Having progressed satisfactorily to their final year in the program, every IS student concentrates their study and research in an MA thesis and its defence at oral examination. Historically, the program’s understanding of the word ‘thesis’ has been remarkably elastic. IS students may choose to produce either a conventional manuscript-based written MA Thesis (about 120 pages) or an MA Thesis that marries a shorter conventional manuscript-based written component (about 80 pages) with a creative component. This creative component may draw singly or in combination upon any of the discursive, performing, visual and/or artisanal arts and crafts. In such cases, the conventional manuscript-based written component provides a scholarly framework for the creative component.